So it has been awhile since I have blogged anything. I have also realized my website, where the Blog lives, is also in need of updating. I am a person who loves the latest gadgets and tech but at the same time totally filled with anxiety when it comes to upgrading, protecting and generally messing around with anything once it has been set up. I also don’t do it enough to remember what exactly I did to simply upload a pic the next time I need to do it. So I decided the best way tackle updating my website was to indeed buy the latest gadget. I bought the new iPad Pro 10.5 so I could work from the latest platform. Also I wanted a new toy and I had just been paid from my latest gig and it is also my 56th birthday and also I wanted it. The older gentleman at the Apple Store (my age, is that allowed) who sold it to me was very informative and agreed on my choice of model and why I wanted it. I had my last one 7 years and he knew I wanted the same if not more out of this model. The apathetic Young man who helped me set it up, I thought answered my questions and was actually talking to me until I realized he was having a conversation with his coworker who was helping a woman with an Apple Watch. He also yawned when introduced to me. Well kudos to Apple for Age Diversity in their hiring practices. My big question was about Screen Protectors. Yay or Nay. I read many threads online that said definitely Yay till more research produced threads saying definitively Nay. The old guy thought since I was getting AppleCare+ (I know but it has saved me $$ in the past) I would not need a Screen Protector since it would be covered for scratches and cracks done by the user as well as everything else. Now I could have waited the 2 years and right at the end of the warranty get the glass replaced (actually whole iPad for $49) and then got the screen protector after that, but that is not how I roll. I could also have gone to the guys in the Prudential Center and have them put one on for $55. I could also buy an Anker screen protector from Amazon for $9 and do it myself. After telling that all to the older guy at Apple he agreed sure why not, $9. I got the $9 one and spent the night tossing and turning in anticipation of putting the damn thing on. Not really but it was on my mind. I got one with a unique hinge application system that I thought I could handle. This morning I set out to apply it. It was aligned and set up. I used the alcohol wipes then the dust wipes then the dust remover sticker. I do this like 6 times. OK now time to place the screen down on the iPad. Maybe just one more pass with the dust sticker. I catches the hinge thing (included) and knocks the whole thing out of alignment. I realign and repeat steps 2-4. This time hinge thingie (included) was not tight enough so it knocks the screen protector askew. Align and repeat steps 2-4. Finally I am ready to peel off the back of the Screen Protector. OK so steps 1-4 a couple more times, but it falls into place on the iPad screen and does this magic adhering thing. Then I see it. 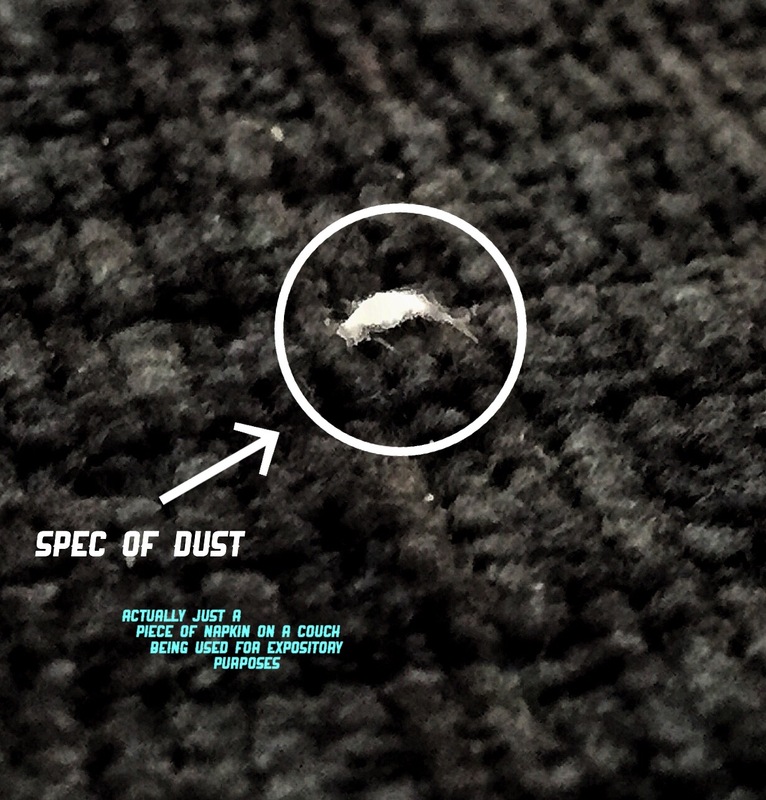 A Spec Of Dust! One tiny spec of dust right in the middle of the screen. HOW? WHYYY? I had repeated the steps I followed the directions. Do I lift it up to get to it. A lot of people on various threads said Yay while others said a definite Nay. Who do you believe? Better still who could I blame? Now I am the type of guy who checks to see if he locked the car at least twice before leaving it. I know well how you can ruin a trip with the sentence “Is the Iron unplugged?” I know in my very being when a picture is crooked and where the defect is on any new anything I buy or am given. So this tiny spec of dust sat in my very soul like a flaming hot coal. Are you gonna let that spec of dust just sit there like that. Don’t you want to risk more dust, bubbles and possible cracks by prying off a corner of a GLASS Screen Protector and repeating steps 1-4? That Spec of Dust will still be mocking you when you sit down and blog about this!! Well after looking at my now old iPad 2 I realize even with all the OCD swirling around I hardly ever seem to clean the screen. Go figure right. I can also ignore a fair amount of housecleaning too, but the door is always locked when I leave my dirty house. I check. I’m pretty confident that spec of dust will blend in soon enough. Of course I could show it to a sane person, like my husband, who will ask “What Spec of Dust?” Ya that route never ends well. So I have decided to live with the Spec of Dust. Why with everything going on in the world now or actually since humans has become cognizant of their interactions with it, why is it always the little things that seem bring us to out knees? Next I am hopefully going to update my resume page with my last play and post new pics from it. Right now I’m going to see how to post this using the new Beta editing program I guess I allowed when re-logging into WordPresss. Oh and I also bought a New Military Standard Drop Tested IPad Pro 10.5 case…..with a cover. You can never be too careful. Thanks for reading. We are all role models for each other I guess!